The Kenneth Leslie book, Oil Pastels: Materials and Techniques for Today's Artist is the one reference recommended as best by every serious oil pastelist I've met. It's currently out of print but this volume is still available on Amazon through various resellers at varying prices. It's worth purchasing even if you can't find a bargain lower than cover price -- and worth getting a copy that still has the incredible jacket art by author Kenneth Leslie. When I first saw this book's cover in a friend's post raving about it, I thought the image was a photo -- an attractive arrangement of different oil pastels layered and laid out in chromatic order. I enjoyed it a lot and thought the jacket had a good design. I've always liked still lifes of art supplies, especially in strong colors. When the book arrived, that's when I found out that isn't a photo. The author painted a still life of his oil pastels in such striking detail and accuracy that it's better than photorealism -- pushing the detail to show that oil pastels can achieve realism. More than anything else, that jacket art demonstrates the great techniques possible with this new medium. There's the image of that gorgeous cover for you -- it's better full size in real life. While the Kenneth Leslie book is a little dated in its descriptions of artist grade brands available since Cretacolor Aqua Stic watersolubles were invented after its publication, rumor has it the author is planning a revised, updated version. Other than that brand, his descriptions of artist grade oil pastels, their history and working qualities are extremely useful. This volume became one of my primary references for some of the articles on this site. The images and demonstrations in the Kenneth Leslie book are helpful. I found a wide range of styles and techniques described clearly along with interesting bits like how to make your own oil pastels and how to use oil sticks. The variety of techniques is excellent. Both wet and dry techniques are covered along with different surfaces and specialized techniques like sgraffito. Some of the sections are useful no matter what medium you work in, such as the chapter on Color and much of the design and planning involved in doing landscapes or still lifes. Nothing is neglected in this encyclopedic reference. You can find information on health and safety concerns with using toxic pigments, permanence, protecting, storing, framing your paintings. 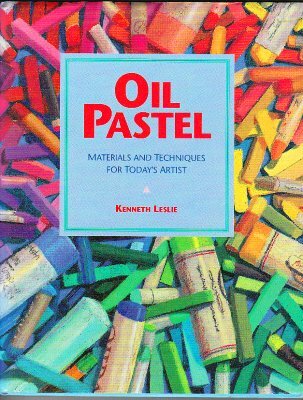 I have yet to run into a serious question about oil pastels that isn't covered somewhere in the Kenneth Leslie book. An entire chapter deals with mixed media and experimental techniques such as hot work, collage and printmaking. I had no idea that oil pastels would be so great for monoprints. The book is full of good ideas for things you can do with your oil pastels when you get tired of doing your usual work. Everything from full on realism to loose modern art is analyzed and described in ways that make it easy for a beginner to get good results. It's the primary reference for most of the serious painters I know for good reason. Find a way to get a copy -- hope you can get one that has the good jacket too. It's hardback and durable. I'm thinking of taking the jacket off and framing it, since the art wraps around to the back too. But don't hesitate if you can't get the pretty jacket. Just like all my serious professional artist friends, I use this book constantly and it's easy to look up anything I'm curious about. History, dates, chemistry, techniques, methods, everything is in this volume. Do yourself a favor and find a copy.